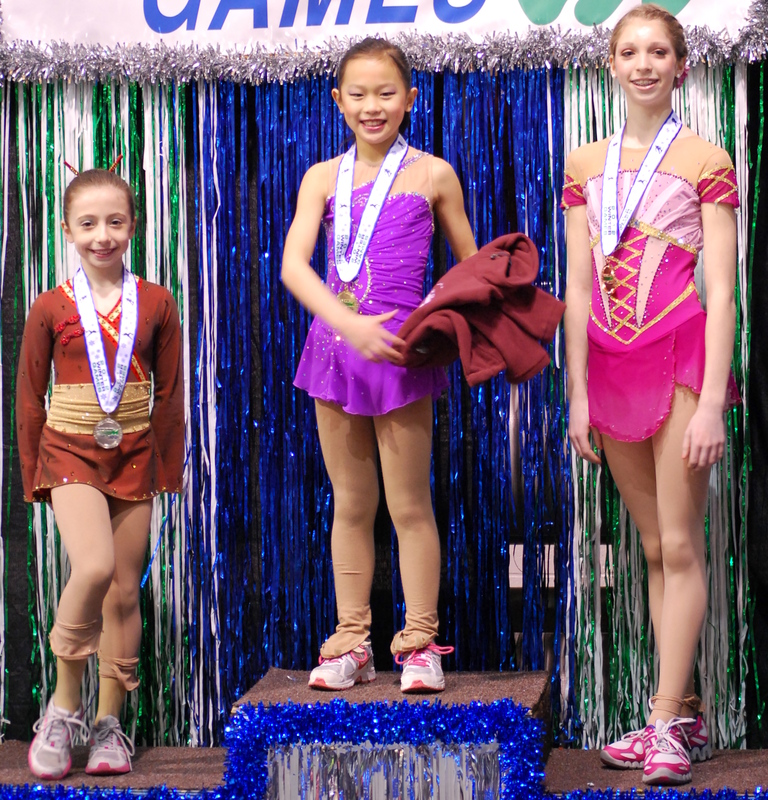 Recently, in figure skating competition of the 2012 Bay State Games, 10-year-old Acton resident Irsi Zhao won the junior figure skating championship for the second year in a row. The winter games were held at Williams College, and attracted more than 500 contestants from New England. Iris Zhao (middle), second place Weston’s Jade Esposito (left), and third place Hopkinton’s Marisa Nagel on the podium. In the 2.5 minutes freestyle routine, Iris Zhao skated along with the beautiful “Butterfly Lovers” music, flying like a purple butterfly on the ice. There were a few difficult elements in her routine, such as combination of triple and double jumps. Iris completed her routine perfectly, and won warm applause and cheers from the judges and the audience. According to her mother, May Liu, Iris is a lovely child, love to smile. She followed her sister Rose like a tail, and they do everything together, including all sports. When she was 4-year-old, Iris put on the first pair of skates on ice, and skated after her sister. Her balance and coordination was very good, and soon moved up several levels. After starting freestyle lessons, Rose’s coach Kristen also gave Iris some side classes. Iris really enjoys being on the ice, whether it is practicing her routines, or chatting with her ​​teammates on the ice. When she is on the ice skating around, she seems completely immersed in her own world. Because of her small size, Iris never seemed to get hurt even training for the difficult routines, and always has a smile on her face with the two cute little dimples. Coaches often joke that they simply cannot be harsh to her. Beginning in 2011, Iris Zhao competed in the Bay State Games on behalf of Colonial Skating Club. In her first appearance at the junior level, Iris won third place finish. VP of Peking University Enge Wang Reviews Physics in China at Boya Forum.